The Poetics, by Aristotle, written in 350 BC, is an early attempt to capture the theory and structure behind dramatic and poetic narrative, analyzing works like The Iliad and Oedipus. Plots are either Simple or Complex, for the actions in real life, of which the plots are an imitation, obviously show a similar distinction. An action which is one and continuous in the sense above defined, I call Simple, when the change of fortune takes place without Reversal of the Situation and without Recognition. Plot is the most important element. The actions of the drama must be unified and have a beginning, middle and ending. Aristotle places emphasis especially on the reversal, or "plot twist". The hero, or protagonist, should suffer greatly after having a moment of recognition. Through this series of events the audience reaches "catharsis" or some new realization or clarification. 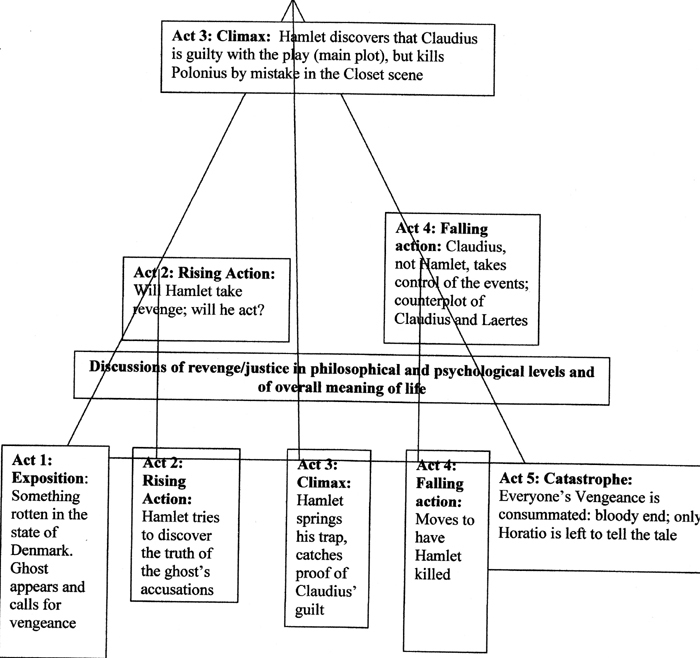 Freytag's Pyramid is a similar plot analysis that is developed by Gustav Freytag to analyze Greek tragedy and Shakespearean plays, published in 1863. He divides works into a dramatic arc with five sections. In The Art of Dramatic Writing, Lagos Egri articulates further concepts for dramatic writing, focusing on the idea that every work of narrative must have a premise, which is a simple concept that it is demonstrated through the narrative arc of a work. 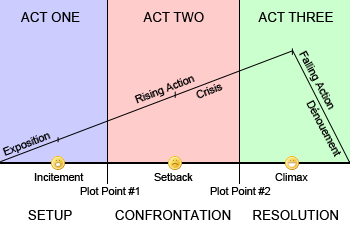 Modern Hollywood movies tend to a follow a simplified structure articulated by Syd Field called the three-act structure. More recently, Kurt Vonnegut has demonstrated how the plot of story can be represented visually. Prior to the modernist period, most works of narrative followed time chronologically, which exceptions like Arabian Nights. In the modernist period, fiction writers and dramatists begin experimenting with narrative structure and dramatic strucutre. Roshomon (1950) by Akira Kurosawa, based on the short stories "Rashomon" and "In a Grove" by Ryunosuke Akutagawa, is very influential on thinking about narrative time. Although the plot unfolds in different tellings of the same period of time, the film itself has a traditional plot arc with exposition, rising action, climax, and a reversal. 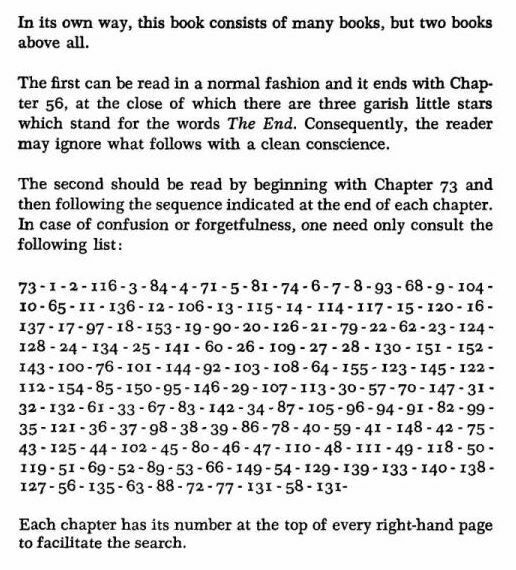 Hopscotch by Julio Cortazar (1963), has instructions to read an alternate order of chapters. Interactive narrative, in most cases, differs from nonlinear narratives in that the author does not have control over the narrative time. Instead, the user usually has infulence over the narrative time and often the direction, but there are many different strategies for introducing interactivity into narrative, for example in some VR experiences the narrative system retains control over time and let's the user control the point of view. Many interactive narratives still attempt to achieve something resembling traditional plot formulas. Interactive narrative has been explored in many forms -- hypertext fiction, video games, choose your own adventure novels, interactive video. 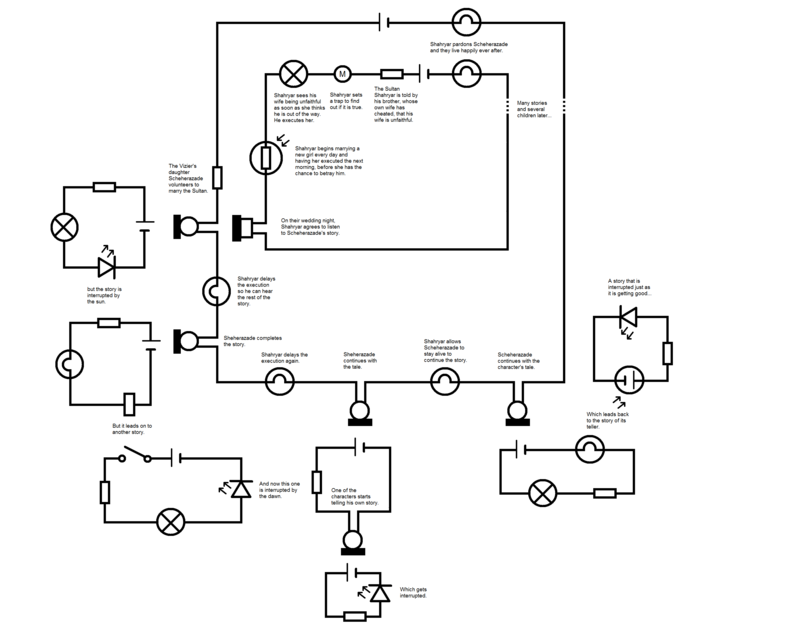 Interactive stories tend to be structured in a few basic ways. Let's look at some examples and try to categorize the narrative structure. Also think about their relationship to traditional plot arcs. In Understanding Media, Marshall McLuhan introduces the idea of "hot" and "cold" media. Hot media has a lot of data, high definition, like film or radio, and requires little user participation (sort of like what Scott McCloud calls "closure" in Undrestanding Comics). Cold media, like speech or cartoons, requires high user participation because we are filling in the gaps in the experience created by the low resolution. Would you define interactive work as hot or cold?